Honoring the ladies in the AXE Army! These tees are the bomb! Featuring new 3/4 raglan sleeve cotton shirt stock from Bella. Racy lines for a sporty look -- soft and stretchy for a perfect feminine fit! Rich durable silk screen front and back and on both sleeves. 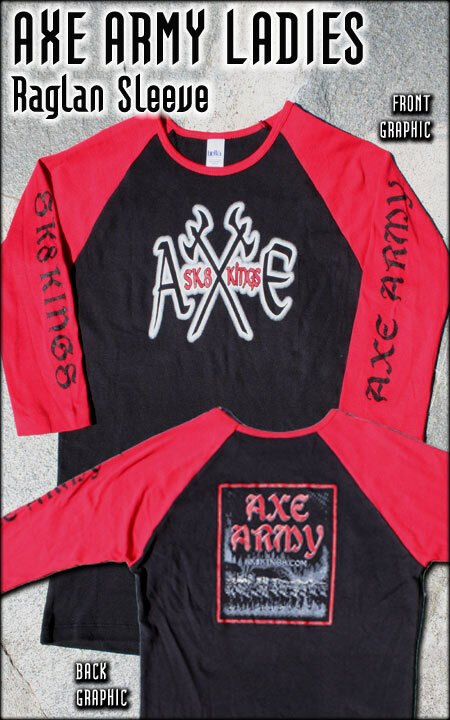 Our original AXE logo is front and center, the back is screened with our "AXE Army Racing Legions" graphic with each sleeve printed too! Available in three sizes -- small, medium & large - black body with red raglan sleeves. Be sure to check out our "Girly Tees" category for a look at all our logos in cap, short and 3/4 sleeve styles.